Card Text Action: Gain 1 for each enemy creature that was destroyed in a fight this turn. 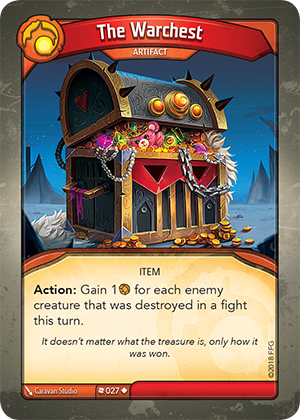 Flavor text It doesn’t matter what the treasure is, only how it was won. Can I use The Warchest’s “Action:” ability if no enemy creatures were destroyed this turn (for effects like “Each time you use an artifact, gain 1 Æmber”)? Can I gain Æmber for creatures destroyed after using The Warchest’s “Action:” ability? No. You gain Æmber only for creatures that were (past tense) “destroyed in a fight this turn.” You do not gain any Æmber for destroying creatures after The Warchest has been used. As a result, The Warchest is oftentimes used most optimally at the end of your turn.